For the past few days, Nigerians have been inundated with the story of the former ruling party, The Peoples Democratic Party being broke. The internet is equally abuzz with fiction, innuendo and sprinkles of truth as to what is going on within the national secretariat of the PDP. As usual, when it comes to politicians, politics and politicking, it is ultimately about greed, money, ego and power play. Your circular dated 29th of July 2015 with the above title refers. v.	Abolition of the Research Directorate and transfer of its functions to the Peoples Democratic Institute (PDI). vi. Establishment staff who would remain are required to obtain individual letters of revalidation from their state party chapters within one month of this circular as to their suitability for service at the National secretariat. 1. We wish to state unequivocally that the establishment staff of the National Secretariat were engaged on the basis of a well articulated establishment manual that expressly states the conditions of service therein. 2. We wish to observe that the last paragraph of your circular which requires that the staff of the National Secretariat should get a revalidation letter from their states chapters suggest that staff of the secretariat have been summarily dismissed from service. This action is contrary to the reviewed establishment manual which has been in effect. 3. While we appreciate the fact that the party is no longer in power, we are equally aware that the Party realized over Eleven Billion Naira (N11,000,000,000) in income from the sale of nomination and expression of interest forms in the last quarter of 2014. We are equally aware that the NWC collected over a billion naira from the sale of delegate forms via a company account called Morufi Nig. Ltd, Zenith Bank Account N0:1014041654. With this healthy bank balance, we find it strange that after just two months of handing over power, the NWC is proposing a 50% reduction in staff emoluments. 4. We have also observed from publications in the media that the NWC shared outrageous largesse to themselves immediately after the party’s loss in the last General Elections. 5. We are appalled by the whimsical and derisory nature of the circular which unfortunately negates all known administrative procedure. We wish to recall that the National Secretary who is statutorily in charge of the administration of the Secretariat has NEVER called for a staff meeting or held any interactive sessions with the staff since his privileged appointment. 6. We wish to draw the National Secretary’s attention to the fact that there are administrative procedures for the disengagement of staff whose appointment have been duly confirmed. i. 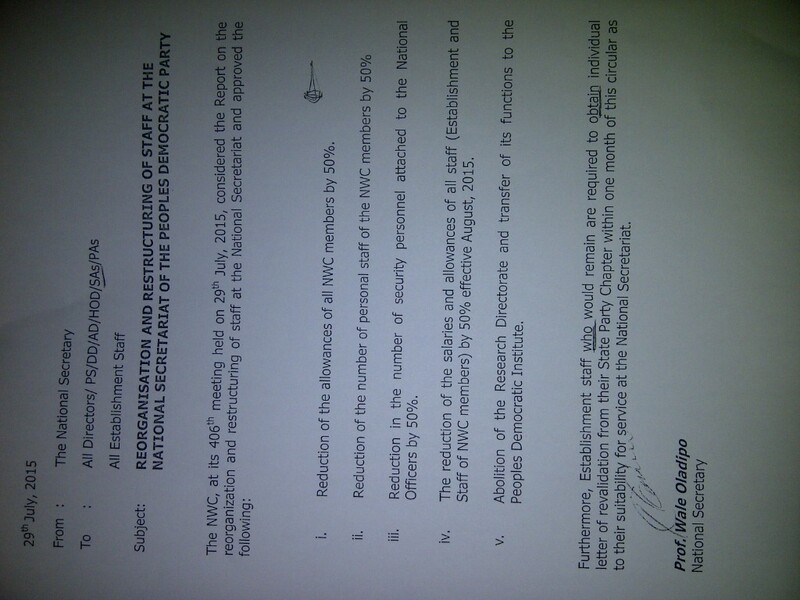 We welcome the decision of the NWC to reduce their personal staff by 50% most of whom exist only on paper. This will save the party enormous funds frittered away on non-existent personal staff. ii. We reject in totality the proposal to reduce staff emolument by 50%. This is because unlike the members of the NWC, the staff are solely dependent on their salaries and allowances. iii. We reject the directives for staff members to get revalidation letters from the State chapters as this act will amount to accepting our unlawful disengagement from service. iv. We have unwavering belief in the possibility of the party bouncing back. We therefore urge the NWC to have the same faith we have rather than engaging in activities that will undermine the resolve of the Peoples Democratic Party to rebound. We wish to once more pledge our unflinching loyalty and support to the Party and its organs and pray that the fortunes of the party improve in due time. Please accept assurances of our highest regards always.